Dotpay enables fast and handy Internet payments accepting for sellers in e-shop based on PrestaShop. Start your account and see how much you may earn accepting payments online via Dotpay! Cooperation between Dotpay and PrestaShop is an answer for sellers needs who minimalizing efforts want to increase their selling opportunities. The possibilities offered by PrestaShop are not limited only to basic Internet shop functions. They offer many more - versatile offer of developing an offer, sales analyses, banner systems applying and comments, RSS channels or goods comparison. A useful functionality is individual creation of graphics changing this way the e-shop looks. What is more, the program may be developed by external modules. 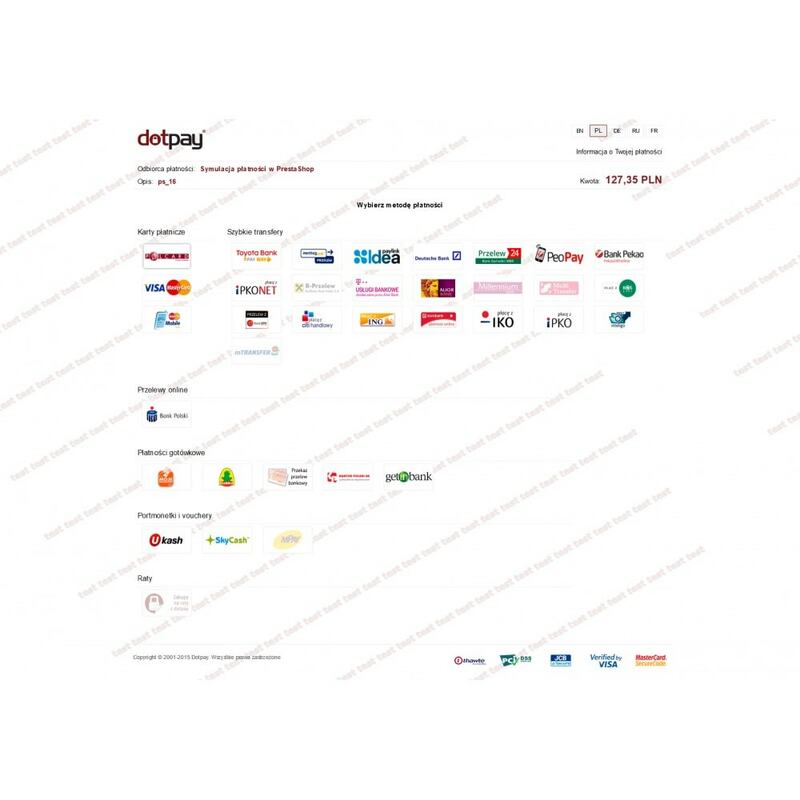 Dotpay S.A. is one of the largest and most recognisable companies on Internet payment industry. For many years have delivered innovative solutions in financial agency sector. What decides on trust of thousands satisfied clients? Dotpay offers the widest Internet payments offer on the market including over 50 payment channels, supported by Premium Rate mobile phone services - micropayments. If you want to make higher profits- trust Dotpay! Cooperation with Dotpay and PrestaShop resulted in online payment accepting via a dedicated module. Its usage is very easy and handy. The only steps needed to be taken are ID and PIN numbers as well as URLC confirmation configuration. 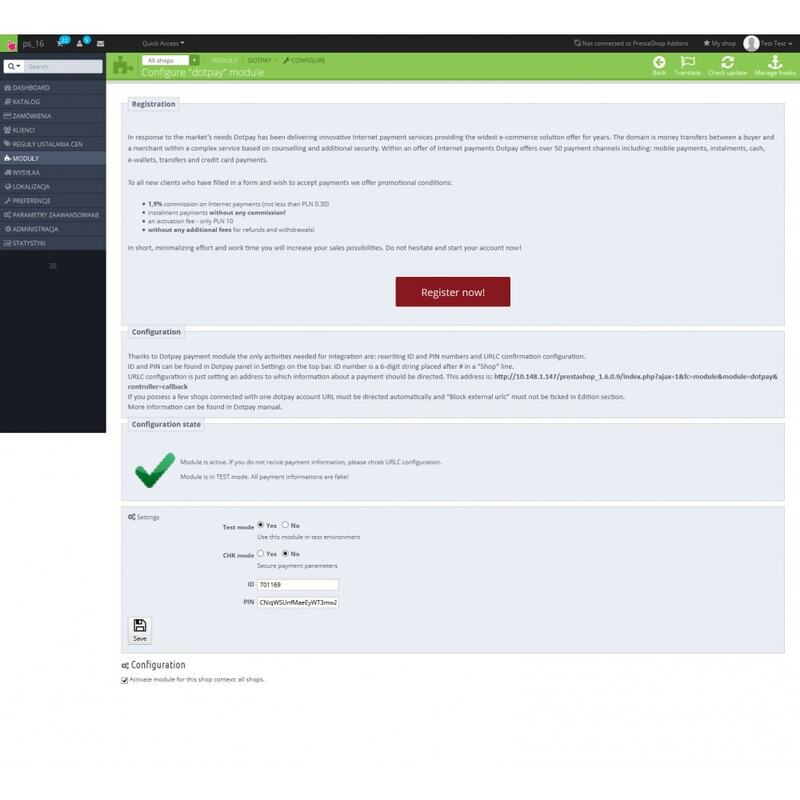 What are advantages of setting an account in the module? The key aspects are connected with using a wide range of technological solutions and a stress put on security on payment making. Dotpay clients receive the widest offer on Internet payments including over 50 payment channels, e-transfers, credit cards, online transfers or cash payments. Moreover, Dotpay has started 2 segments of Premium Rate services connected with a single sending and with a subscription. Do not hesitate and start your account now- Dotpay online payments means profit for your business! Dotpay as one of the leaders in its industry offers the widest offer on the Internet payment market including more than 50 payment channels, transfers, credit cards, e-transfers or cash payments. Thanks to Dotpay payment module the only activities needed for integration are: rewriting ID and PIN numbers and URLC confirmation configuration. ID and PIN can be found in Dotpay panel in Settings on the top bar. ID number is a 6-digit string placed after # in a “Shop” line. URLC configuration is just setting an address to which information about a payment should be directed. If you possess a few shops connected with one dotpay account URL must be directed automatically and “Block external urlc” must not be ticked in Edition. More information can be found in Dotpay manual.